Is this the Tackiest Place on Earth? 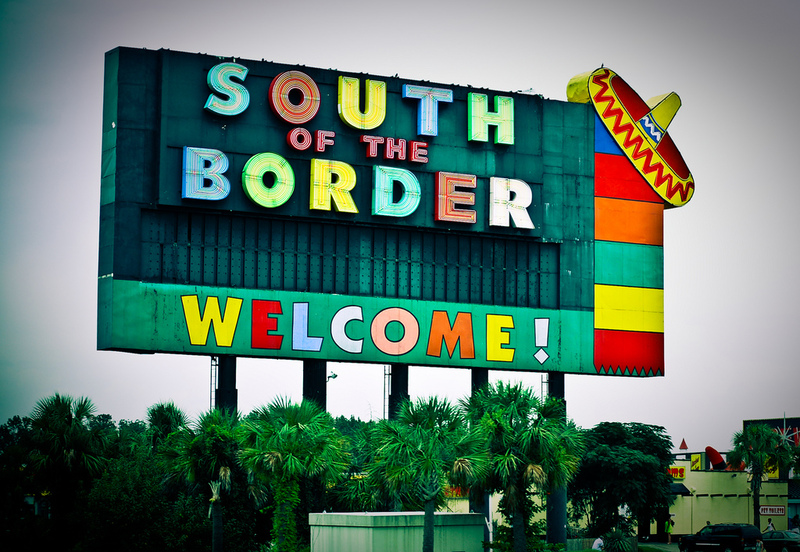 Since I haven’t been to every single place on Earth I can’t attest as to whether South of the Border in South Carolina is in fact the tackiest place, but it certainly would make a Top Ten list. Oasis or Quagmire of Kitsch? They call themselves a “highway oasis.” Well, it is, something. In fact it’s a collection of shops full of kitchsy crap like fake poo, oversized pencils, tshirts with ridiculous sayings, shotglasses with every conceivable animal adornment, and anything else you can think of. It’s the kind of stuff that’s usually not Made in America and surely must make those factory workers wonder what is wrong with Americans for wanting all this crap. BTW – these are the only pics on this post that I took. See the Disclaimer below for more details. All that sarcasm aside, South of the Border is WONDERFUL! I called high school friend Regina the. very. second. I. arrived. Why? Because the absurd oversized fiberglass animal “statues” were a delight! And the neon, oh the neon. There’s no missing South of the Border. Billboards line the roads for miles – like hundreds of miles. They’re funny, goofy, even dorky. Bless their hearts. Only a fraction of these photos are mine. Driving solo, I couldn’t take pics of the billboards. And once there I truly had too much fun playing to take the time to photograph. Plus, it was too hot and there were too many people. So thank you Flickr and your contributors for capturing memories for me and for sharing the experiences with you fine readers.